Some people love winter. They love the falling snow and energetic snow sports ~ sledding and skiing and all those things that give others only a severe case of goosebumps and chattering teeth. If you're one of the latter, the ones who prefer warmth and sunshine and weather that won't kill you, this sketchbook is for you. 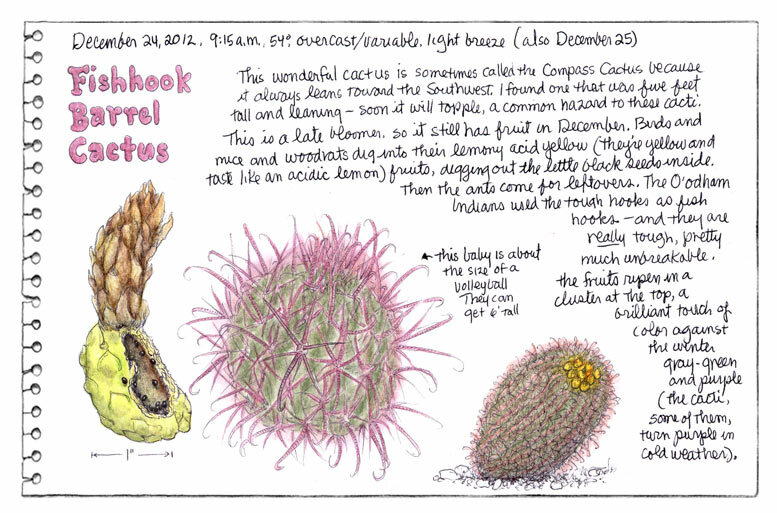 Following the sun one frigid December day, Irene Brady hopped a plane with a bag full of camping gear, her sketching kit and camera, and headed for the sunny warmth of Tucson, Arizona to sketch and draw whatever gifts the Sonoran Desert could provide. (click on images for a larger view). While it was much colder at night than expected, her daytime sketch journal soon collected a treasure of sketches of jumping chollas, Hohokam petroglyphs, brilliant cardinals, an encounter with a Verdin nest in a Wait-a-Minute-Bush, stately saguaros raising their spiny arms to the sky, and a multitude of other adventures. (click on images for a larger view). There's a detailed tutorial for every sketch page in this lavishly illustrated journal. Irene explains why she chose each scene and how/why she created each page in a clear and informative but still engaging way. While you're being visually entertained,you'll also learn about saguaro boots, why cacti don't collapse of their own weight, where the jojoba oil in your shampoo comes from, and one of the plants Native Americans used as a needle and thread (among other things). Photographing her sketch scenes to use later as color references so she could paint her sketches with watercolor pencils, Irene created some fascinating views of the Sonora Desert in winter, when the nights may be in the twenties but the daytime temperatures are shirt-sleeve warm. Click on the spread below to see two adjacent pages from the sketch journal. Each page of the sketchbook has been reproduced in its original 8.5" x 5.5" size, so you can see the details. In the tutorial you'll find out what the original sketch looked like, then what she did (if anything) to tweak it to its final appearance. The tutorial pages offer advice on such things as sketching pleine air in the spiny cactus landscape, what to do about painting if there's no opportunity during your journey, how to deal with crowds in zoo settings (see the Bighorn Sheep image) ~ and much, much more. Sometimes when there's no drawing opportunity, you can photograph your subjects and work from your photos or your camera's viewscreen later. The Javelina (wild pig) below and the scene that accompanies it in the sketch journal are one example of such a situation, and Irene goes into some detail to explain how to assemble a composite after-the-fact kind of page. Irene usually colors her sketches each night in her lodgings, using her photos for reference. But this trip she was camping out, and since it was so unexpectedly cold at night, there was no opportunity to paint. Returning home to her studio, she realized she could create an additional detailed step-by-step painting tutorial workbook as she added color to her journal sketches. Pausing numerous times during each painting to scan and comment on her progress, she has created an intimate look into the planning and execution of each painting from start to finish in this companion volume, The Cactus Country In Watercolor Pencils (at left). As an additional bonus, she reproduced the original pen sketches which you can print out, if you want, and actually color step by step using the detailed instructions in the tutorial. 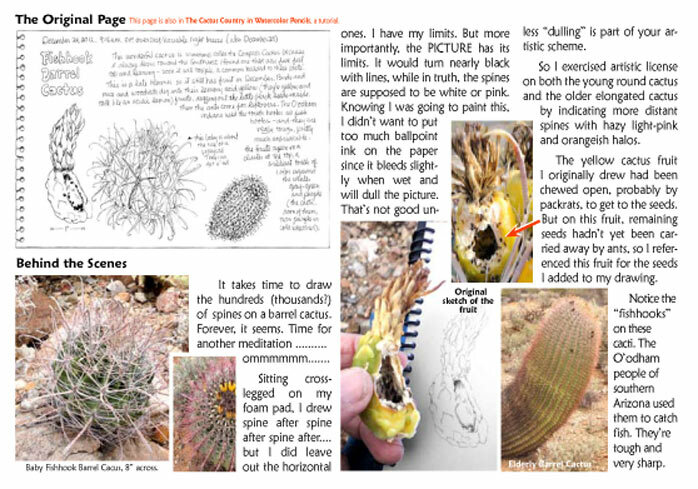 The Saguaro Sketch Journal is in the form of a PDF which you can download then open with Acrobat� or Acrobat� Reader�, save to your computer, and print out immediately on 8� x 11 paper if you want. COPYRIGHTED � 2013, by Nature Works Press. All rights reserved worldwide.